Hamilton welcomes students from Germany - Hamilton School District. 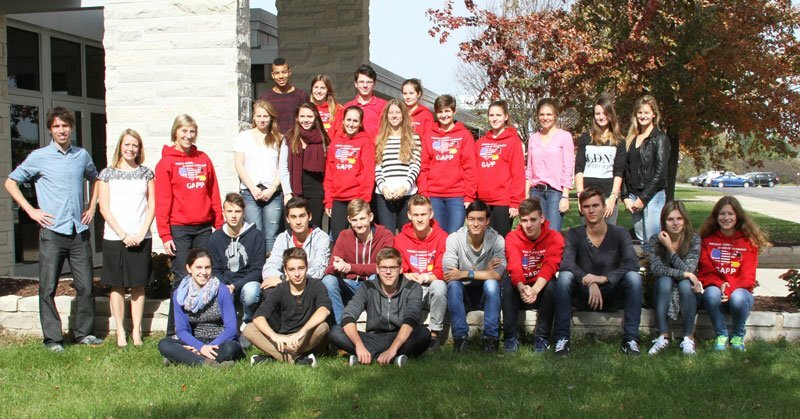 “Welcome GAPP Exchange Students.” This has been the message greeting German American Partnership Program (GAPP) exchange students who arrived in the Hamilton School District Oct. 17 and will stay until Nov. 2. Hamilton German Club members have been working feverishly to make arrangements involved with hosting 25 exchange students and two teacher-chaperones from the city of Reutlingen, Germany. The GAPP exchange opportunity is again offered at Hamilton to promote international understanding among young people and provide students with an opportunity to learn German in an immersion experience. German teachers Lindsey Klein, Eric Schultz and Katherine Leitzke are excited about what this exchange means to Hamilton German language students. Hamilton families and students are hosting the German guests. This summer 21 Hamilton students traveled to Reutlingen for a three-week exchange at the Johannes-Kepler-Gymnasium, a college-preparatory secondary school. While in Germany, Hamilton students attended classes at the school and visited many places of historical and cultural interest. Hamilton students participating in the GAPP exchange are: Nathaniel Atkinson, Meghan Cannestra, Grace Carlson, Bobby Mae Cranfield, Madison Danduran, Connor Engel, Emily Fisher, Tyler Fralick, Hannah Gielow, Alyssa Grove, Erin Heaster, Finn Heaster, Alex Hillmer, Tessa Jaskolski, Ike Johnson, Jack Kinowski, Rachel Klibowitz, Jacob Lehner, Jake Myatt, Kristina Neitzke, Sydney Norlander, Dominic Pino, Sam Richter, Jacob Schneider and Suzanne Smaglik.